Working Holidays are great fun, come and give it a go! Ever wanted to Wake up in a beautiful location, and enjoy a fun-packed day doing exciting conservation activities, and make great new friends in the process with one of our working holidays. Well this is what these guys did. Taking part and getting active on one of our working holidays. 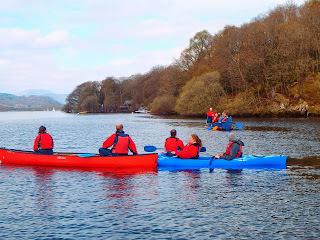 Fun packed week with twists and turns but a fantastic experience, learning about this part of the Lake District, doing some great conservation work and getting a chance to have a go and enjoy a brilliant outdoor activity. The week was spent on a project at Allan Bank Cumbria. Opened to the public for the first time ever in March 2012, Allan Bank is a place to relax in front of a warm fire with a cup of tea while the children play. Once home to William Wordsworth and National Trust founder Canon Rawnsley, Allan Bank was rescued from the ravages of fire in 2011. The house is partially restored and undecorated, the grounds and gardens are under going restoration work by our volunteers and Rangers. The project for the week was to clear and prepare a large area of the garden ready for grass seeding. This area is quite visible to our visitors as they approach the house. Trees have been removed from the crag behind; rhododendron and Laurel had encroached this area of the garden making it unusable. The team started by raking and collecting leafs, cutting out old Rhododendron root systems and picking though the soil to remove stones and rocks. This area of the garden had become overgrown with Rhodos and laurels trees which had also grown up against the chapel. Not only had it become over grown and deserted but throughout the houses life this area may have been used as a dumping ground. Fences, bottles, tiles and much more was unearthed as we preped the site. Once the stones, roots and leafs have been collected or chopped back it was time to gently turn over the soil ready for grass seeding. We use a fast growing Rye grass seed mix which will germinate and establish relatively quick. This will help stabilise the banking and slow down weed growth. This type of seed sowing will also allow us to add wild flowers species and native bulbs in the future. Our holidays are not just about great conservation work. The week is also about trying new activities and getting your feet wet. 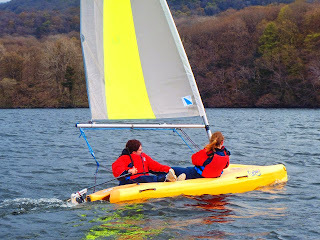 With the help of Tower Wood Outdoor Eduction Centre we are able to let the group try something new in the shape of water sports. 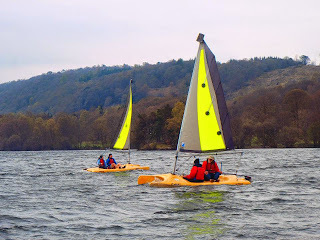 Theres nothing like bobbing about on the water using various water crafts, the day was warm, dry and clear which was a perfect combination to to have fun and view the Lake District fells from a different prospective. 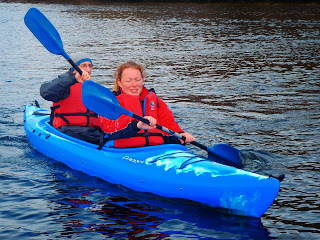 Canadian Canoes, Kayaks, fun boats were all on the menu for the team to have a go and experience something new. 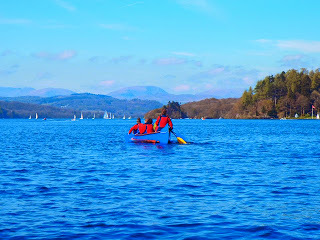 With the great weather and the back drop of the fells it made a fantastic day. The Volunteers had a fantastic day with Loz and the Tower Wood team. 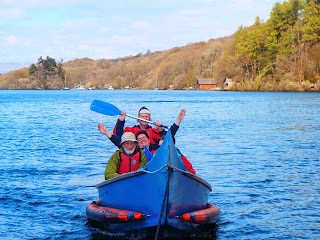 The Volunteers left having a great adventure but ultimately trying a new sport which we hope they may try again. A huge thank you goes to Loz and all at Tower Wood for providing the expertise, equipments and jaw dropping facilities. Tower Wood Outdoor Education Centre which is set in 12 magnificent acres of lawns and woodland, extending from the beautiful Edwardian house down to the eastern shore of Windermere. The site looks across the Lake to the high fells of the Lake District and has an enviable and easily accessible position. 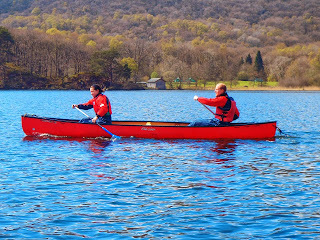 The centre has over 40 years’ experience of delivering safe, high quality, outdoor adventure experiences for all. With its wonderful facilities, Tower Wood can offer a wide range of land and water based activities. The American Invader! Spraying the Skunk Cabbage on The Island at Elterwater. American Skunk Cabbage increasingly dominant. The invasive American skunk cabbage at Elterwater, particularly on the island, has become even more widespread. In spite of the efforts of two of the Central and East Lakes Rangers last year, it is still spreading, and threatening to overwhelm the reed beds and native plants in this SSSI designated area. A canoe, kindly lent by James Archer..Area Ranger based at St. Catherine's, was the ideal means to transport the chemicals and equipment to the island. Spraying the skunk cabbage is probably the only realistic means of getting the situation under some control. Jen Aldous from South Cumbria's Rivers Trust, and three Central and East Lakes Rangers combined forces to deal with the skunk cabbage. For once, the weather was good, and the job could go ahead. Jen, busy mixing and measuring the chemicals to be used in the sprayers. James is assembling a sprayer in the background. A close up of the spray in action. James taking on a skunk cabbage. Many fallen trees and low branches made access very difficult, especially wearing bulky, heavy back pack sprayers. Jen in the midst of a fairly big stand of skunk cabbage. Had to include an image of Godzilla from last year. 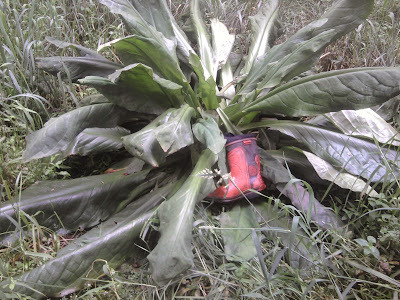 The size 10 chain saw boot looks tiny and indicates how large this skunk cabbage is. With Thanks to Jen Aldous, Invasive Non Native Species Officer...South Cumbria Rivers Trust..., for all her invaluable help in tackling the major infestation of skunk cabbage at Elterwater. Please see link to South Cumbria Rivers Trust web page. American Skunk Cabbage is still a popular garden plant. Unfortunately it easily escapes into the wild where it causes major harm to eco systems, especially near rivers and lakes. Volunteers help combat erosion damage to popular Millerground Footpath. Heavily eroded section of the lake shore,starting to undercut the footpath at Millerground. With the help of a keen group of volunteers, the N.T Central and East Lakes Rangers at St Catherine's continue to repair flood and storm damaged areas of Millerground in order to safeguard the popular lake shore footpath that runs alongside Windermere. Millerground is one of the very few public access points on the east shore of Windermere, most of which is privately owned. A large cavity has formed under the exposed roots of an old beech tree that is threatening to undercut the ground below the path above. Kate and Janet filling the void with a mixture of stone and lake gravel. Frank working on the trench that will form the base for the foundation stones. Foundation stones placed at an angle into the trench. Pitching stone at an angle to form a breakwater for when the lake levels are high. A mixture of small stone and gravel for packing into the pitched stone. Kate pitching stone in and around the tree roots of the old beech tree. Fiddly! Sophie bringing in more stone for the revetment work. A large quantity of stone is needed for even a small area of pitching. All very labour intensive! The revetment. Looks good, and a lot stronger than the crumbling bank it is now protecting! A nice close up of the pitching work. The Volunteers with the power barrow on the path above. Many Thanks to the volunteers for all their enthusiasm and hard work over the two very wet days of the 8th and 9th of M﻿ay 2013.................... We enjoyed working with you.